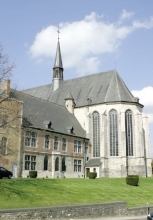 The town of Nivelles grew up in the valley of the river Thines around the abbey founded in 645 by Itte, wife of Pepin I, mayor-of -the-palace to King Dagobert, and ancestor of Charlemagne. Their daughter, St Gertrude, was its first abbess. This double community, ruled over by a woman, became an imperial institution under Charlemagne. Exclusively for canonesses of noble birth, it was suppressed at the French Revolution. 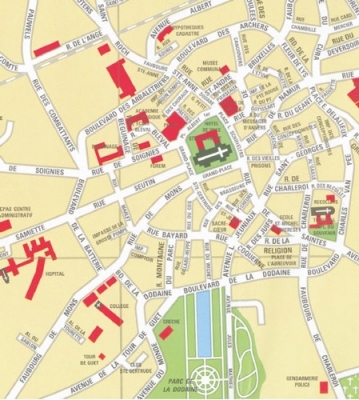 In the 13th century, Nivelles was a thriving centre of activity both religious (13 parishes, 3 almshouses, 1 convent of Beguines) and commercial (lace and cambric making, brewing, tanning etc). In 1940, early in the war, Nivelles was bombed by the Germans. The spire of the collegiate church was set on fire and the treasure destroyed. 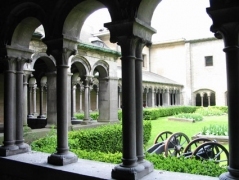 there is a a very romantic cloister, Nivelles’ second. Brussels tapestry (Coxie), furniture and art from the Nivelles area, musical instruments, 4 fine 15th century statues of the Brabant School and numerous objects from the Palaeolithic to Merovingian periods. 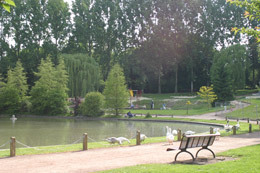 A classified site of natural interest, the former marsh, now an area of pleasant walks, was landscaped by Jean-Baptiste Dangoneau, mayor of Nivelles using unemployed workers during a period of hardship in Napoleonic times (1817). The park is divided into 4 parts: the rectangular pond surrounded by hundred-year-old trees, the French garden, the lake and the Queen Astrid sports ground, inaugurated in 1938. Begun in 1935, this was the first major public health project of the town, an enterprise again providing work for the unemployed. The site was classified on the 28th April 1945 and since then an English Garden has been added (1955), as well as a sports hall, covered swimming pool, sports ground and aquapark. 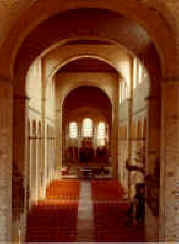 1350 years of architecture can be seen here, from the first Merovingian church (646) to today. The church of St Gertrude is an abbey, (the 13th century cloister remains), a collegiate church (seat of a chapter of canons and canonesses from the 9th century on) and a pilgrim church (purpose built hallcrypt with ambulatory corridors (these no longer extant). It also features a westwork, including counter-choir, apse, towers, and tribune chapels. Above these, the “gayoles” were used as prisons, and the splendid Imperial Room is thought to have functioned as court-room and reception room for the abbess when exercising her civic roles of mayor and judge : until the French Revolution, Nivelles was ruled by a woman. The church is built in the Ottonian style of the great imperial monuments (Holy Roman Empire): Early Romanesque for the 11th century construction, and Late Romanesque for the exceptional Westwork of the late 12th. The ground-plan with a choir at each end is in the Carolingian tradition. 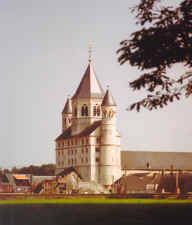 The Westwork features no less than 8 cupolas: this is unique in Belgium and emphasises the imperial nature of the foundation. The Romanesque cloister dates from the 13th century. 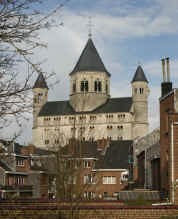 St Gertrude's was concecrated in 1046 by Wazon, bishop of Liège in the presence of the Holy Roman Emperor Henry III. Inside, see the 15th century processional cart, Renaissance stalls, funerary monuments (16th to 18th centuries), 15th century polychrome statue of the Virgin, statues and pulpits by Laurent Delvaux, wall-paintings etc. The Romanesque pilgrim hall-crypt is one of the largest in the country. In the exceptional archaeological basement can be found the remains of churches dating from the 7th to the 11th centuries (Merovingian, Carolingian, Early Romanesque). Visit the tombs of Ermentrude, grand-daughter of Hugh Capet, king of France and Himeltrude, possibly the first wife of Charlemagne. The remains of the Gothic shrine (late 13th), a master-piece in gilded silver, partially destroyed in the bombing of 14th May 1940, are displayed in the westwork. The jaquemart, symbol of Nivelles, strikes the hour, dates from the 15th century and was a gift from Charles the Bold.